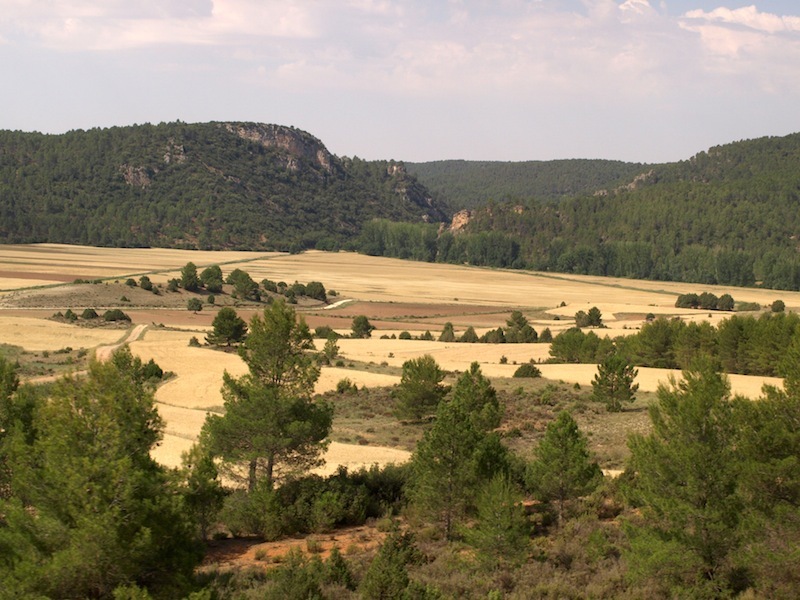 The train journey from Cuenca to Valencia was through mountainous gorge and forest country and Bev says that it was the most beautiful train journey we have done to date. 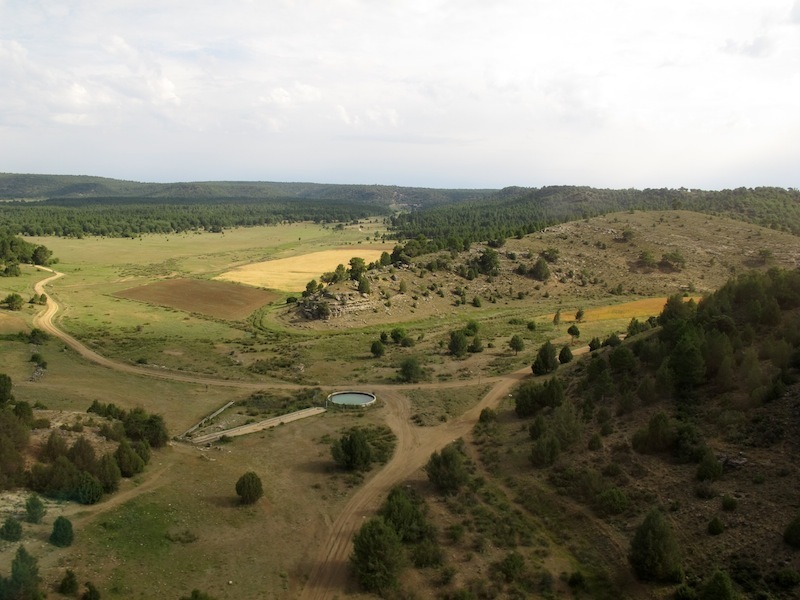 Unfortunately we have few acceptable photographs of the terrain as it was simply too difficult to photograph. The train went in and out of tunnels and across deep gorges and thus there were few clear lines of sight. However we managed a couple. 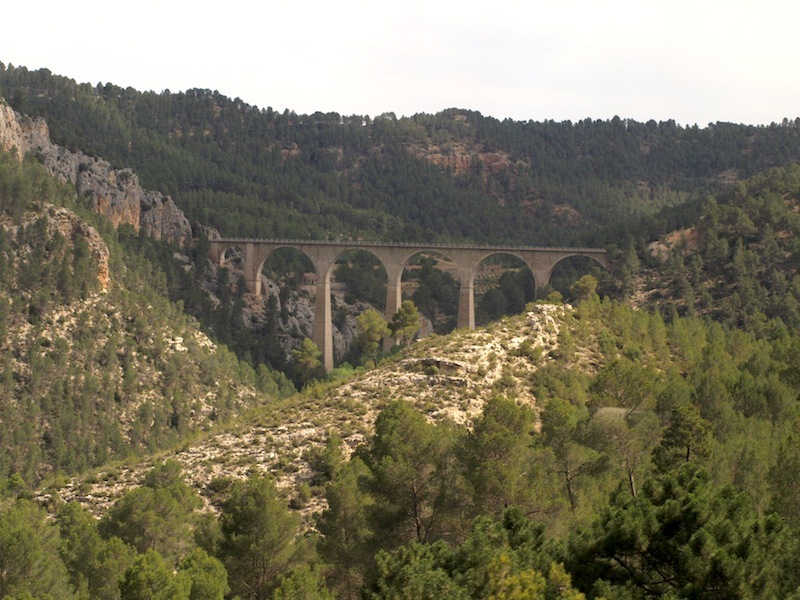 A railway viaduct our train crossed on the journey between Cuenca and Valencia. One of the few clear lines of sight. The most picturesque part of the journey was when the rail line was part way up the side of the mountain. 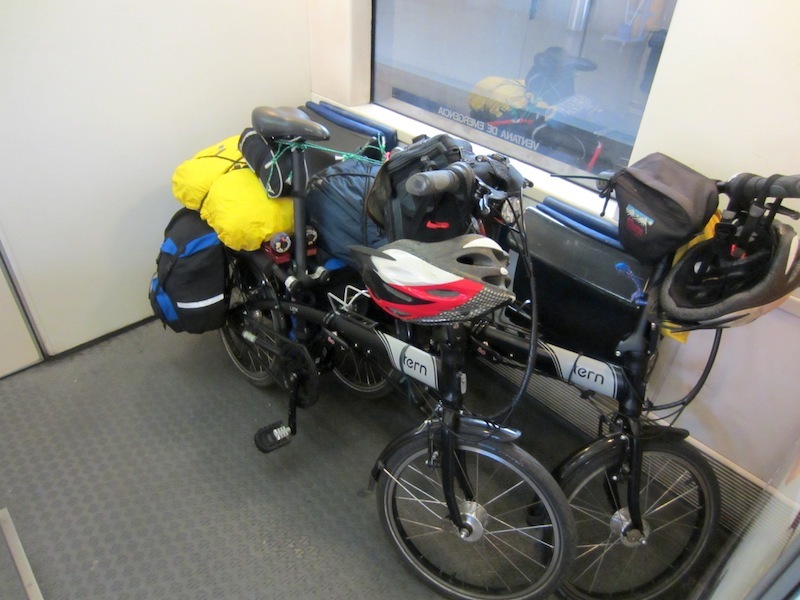 Our bikes, secure on the train from Cuenca to Valencia. If our bikes are not close at hand when travelling on trains I lock them to a security rail as we would hate someone to walk off with them at an intermediate station. If I can’t lock them to the train physically, each time the train stops I stand by them. What a disaster to find them gone when reaching our destination! There are few cities in the world when immediately you step off the train you come face to face with the city’s architectural delights. 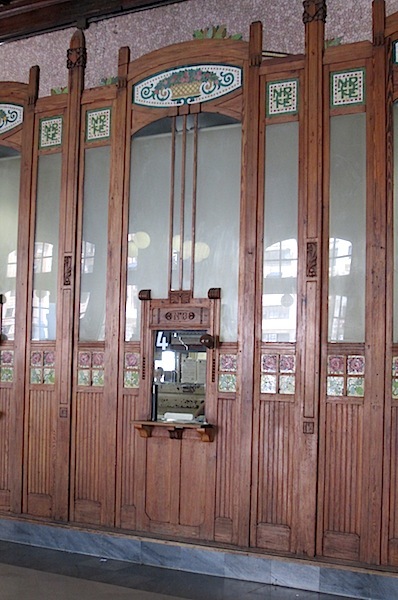 In the case of Valencia, the first architectural delight is the railway station. The railway platforms, entrance hall and the whole railway station generally is unique and if we didn’t bother to see another building in the city we wouldn’t have worried. 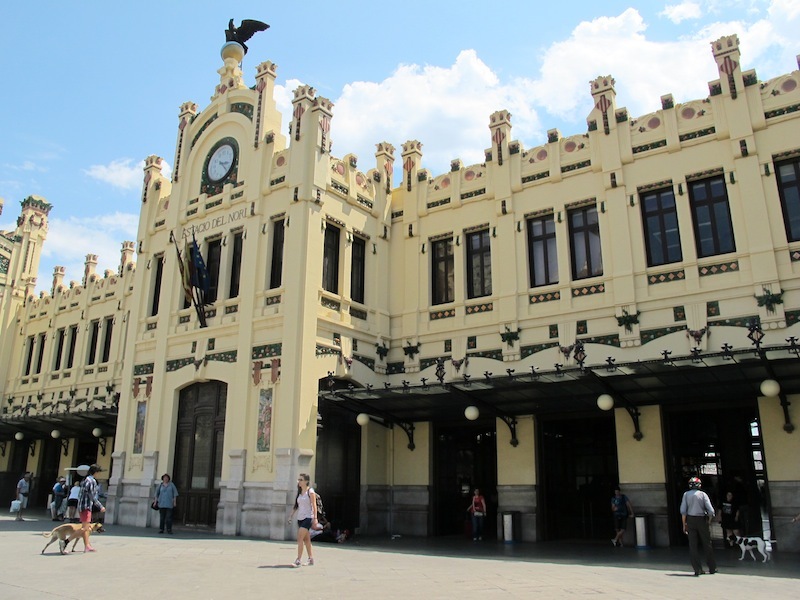 The Valencia Railway Station was built in the early 1900s and is considered to be of modernist style. 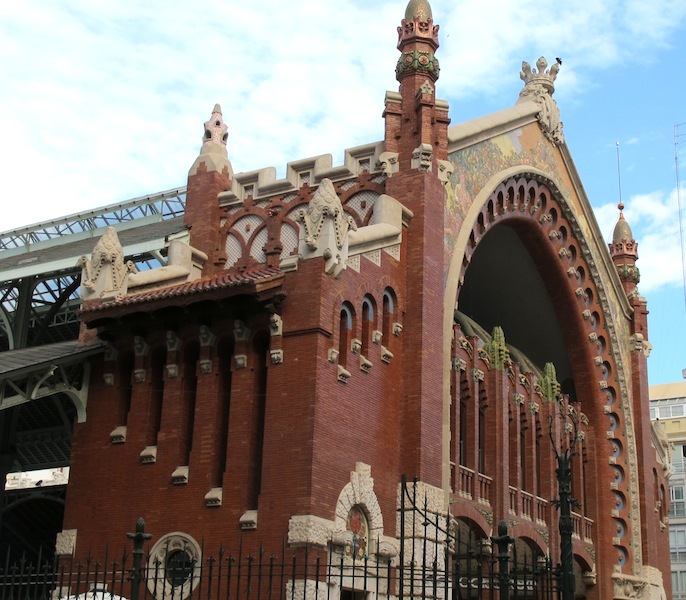 The modernist style began at the start of the 20th century and it came about because architects and builders wanted to take advantage of the rapid technological advancements at the time, for example, the use of steel for the arches over the platforms. The following photograph shows the arches. Steel arches over the Valencia railway platforms. In my mind the station looked old but modern, if there is such a term. The reason I use the old but modern term is I couldn’t fathom which era of architecture to put the station design into. 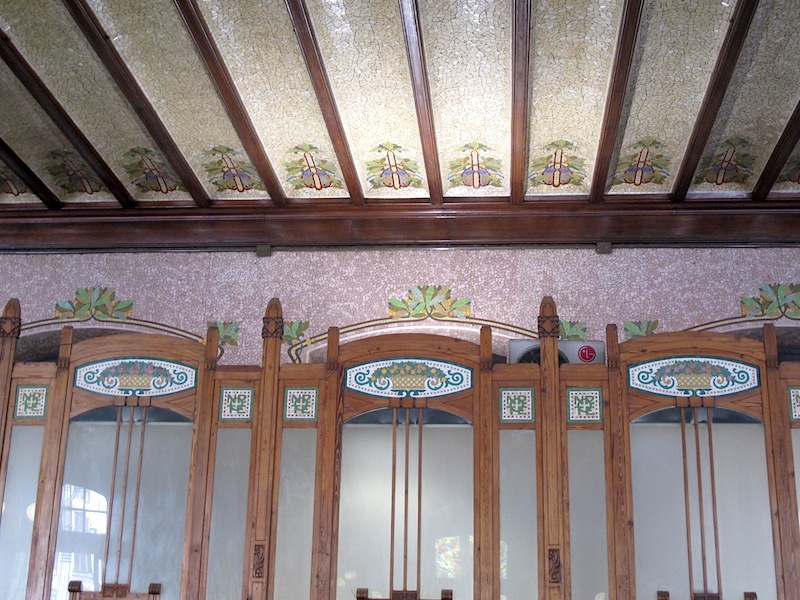 However after further research I now believe Art Nouveau may describe the station admirably. 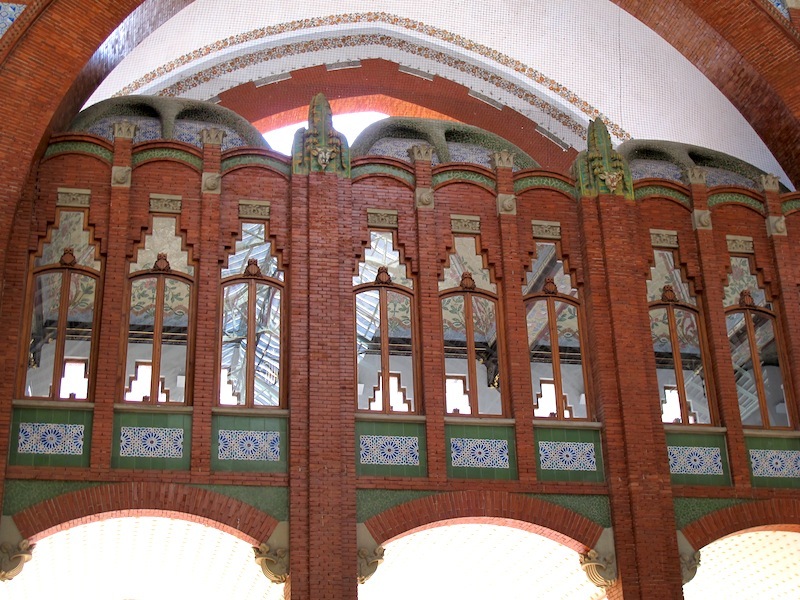 This column in the main hall of the station is an example Art Nouveau at its best. 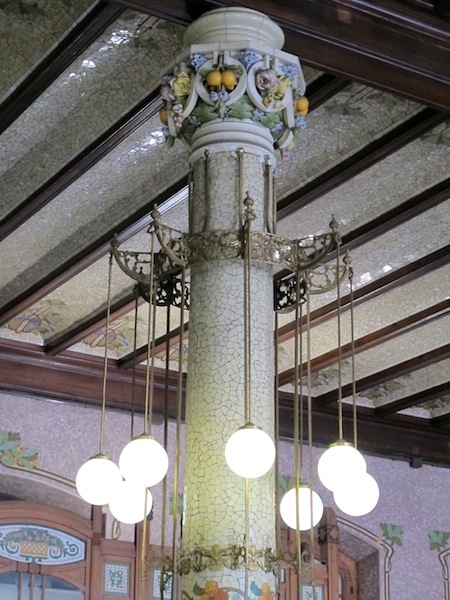 The following photograph shows in detail the ceiling above the column. The ceiling and the top portion of the ticket sales counter. 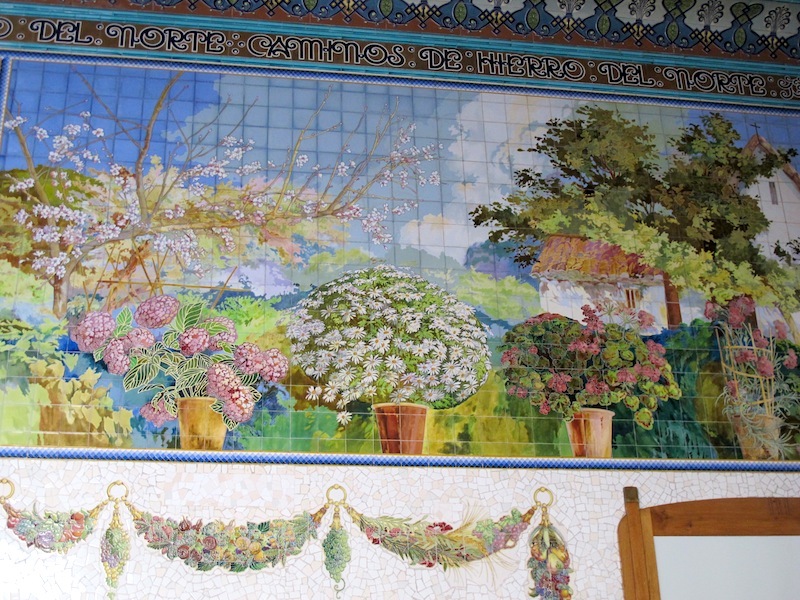 Exquisite tile work on one of the main hall walls. 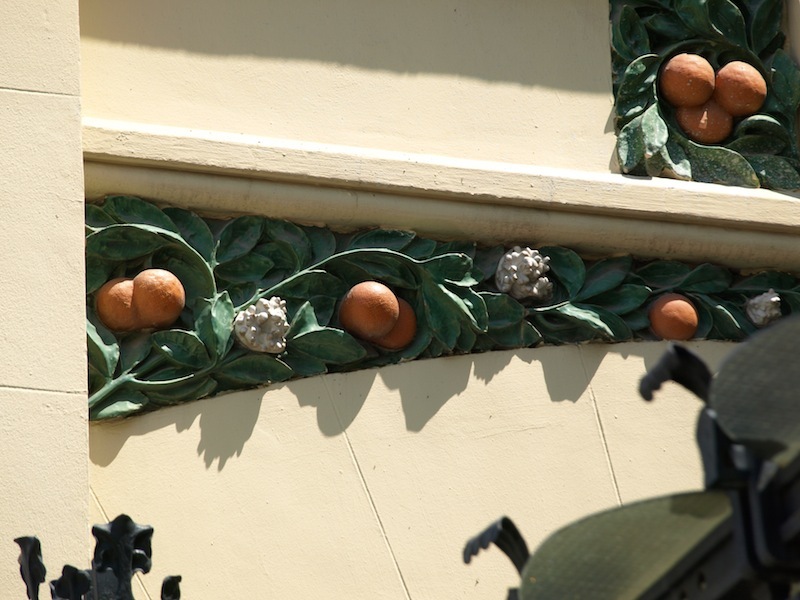 The floral arrangements at the bottom of the image are called festoons or swags. Australian swagmen carried a swag which comprised a blanket tied at each end. I think I could safely say the origin of the Aussie swag came from this architectural term. 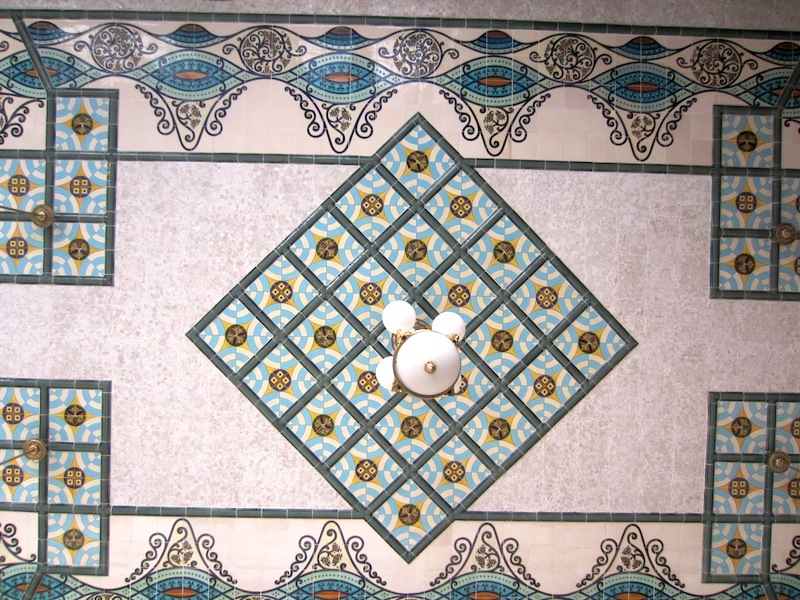 The tiled ceiling of a room off the main hall. To fully comprehend what you are looking at in the above photograph imagine you are lying on the floor and looking straight up at the ceiling light. The main window of the station booking office. Note the Valencia oranges. 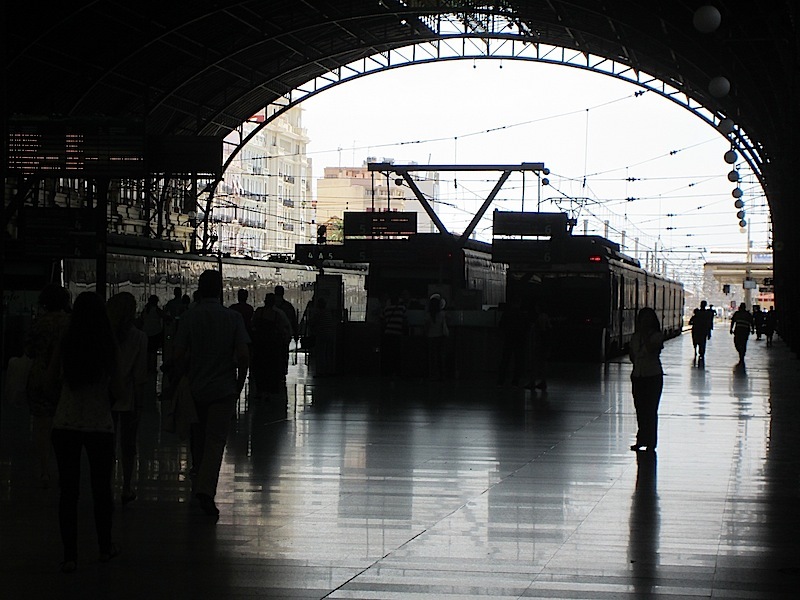 By now you realise that the Valencia railway station is no ordinary station. It is a building of great beauty, a masterpiece of engineering and an example of human artistic endeavour at its best. 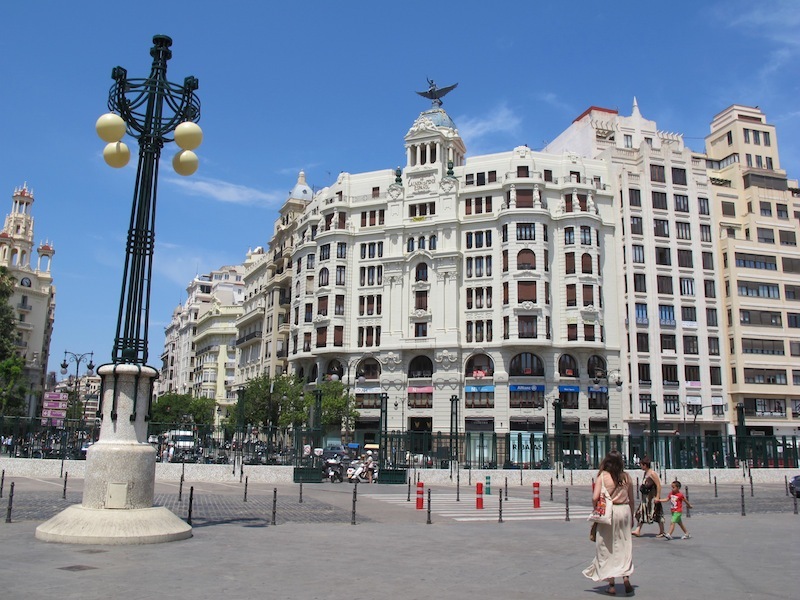 And here it is, the street entrance to the grand Valencia Railway Station. 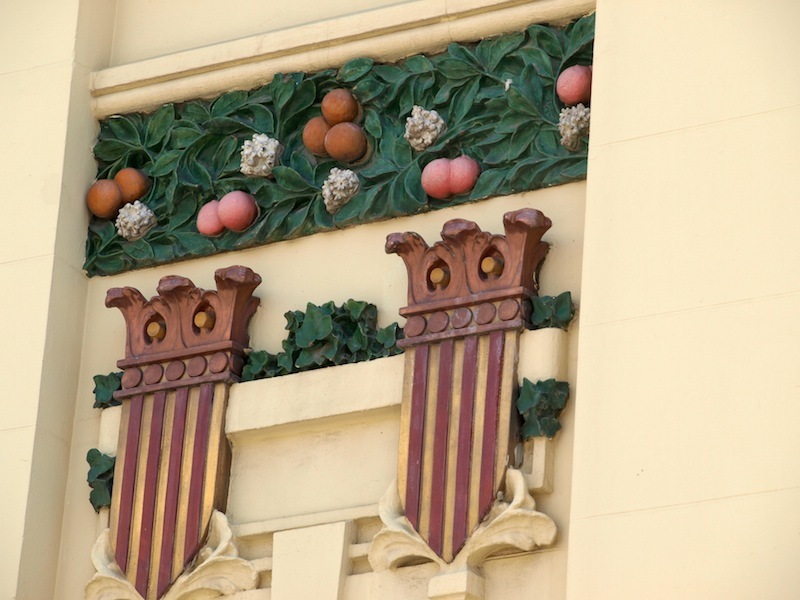 Valencia oranges and even orange blossom decorate the outside of the station. The Valencia orange is not a native of Valencia. Its ancestors were it is believed to be the Indian Wild Orange. It is not certain when the first Indian oranges were introduced to the Valencia region. Some references suggest the Arabs or Italians took them there in the mid 1400s while others say the Portuguese brought them into the region in the 1500s. Regardless, they grew well around Valencia. An American agronomist in the mid 19th century took them from Valencia to his farm in southern California and hybridized them and the results of his efforts are the Valencia oranges we eat today. Fruitipedia quotes: ‘The Indian Wild Orange is likely one of the ancestors of today’s cultivated citrus fruits, if not the main one’. Wikipedia quotes: ‘Indian Wild Orange is believed to be the most primitive citrus and the ancestor of the cultivated fruits of today’. The Indian Wild Orange grows in a very limited area in India and is considered endangered due to habitat destruction. 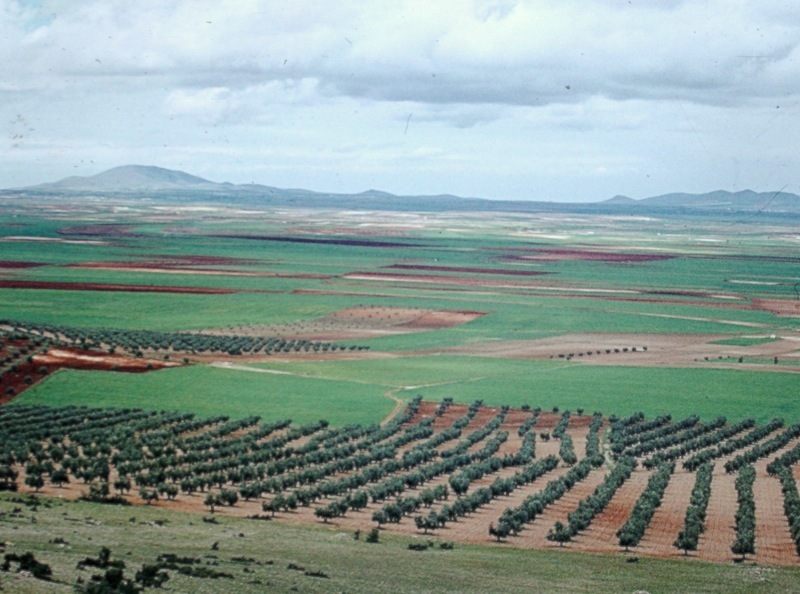 Orange groves near Valencia in 1973, the last time we were in the region. The above image is forty-two years old and was taken with my Pentax Spotmatic camera using Kodak transparency film. If I remember correctly, when we stood and looked out across the orange groves and plains in 1973 we felt a little homesick. 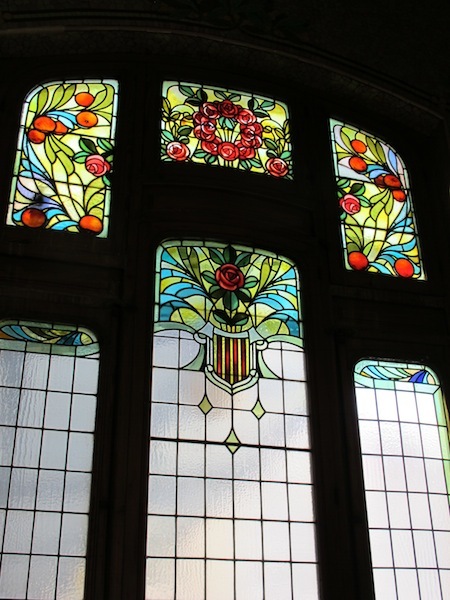 An Art Nouveau version of the Catalonian coat of arms with Valencia oranges overhead. The coat of arms as best I can determine is based on the pennon which was carried by the armies of King James 1 when they banished the Moors from Valencia in 1238. In the flag world a pennon was one of three varieties of flags carried during the Middle Ages, the other two were the banner and standard. Valencia Railway station parapet. 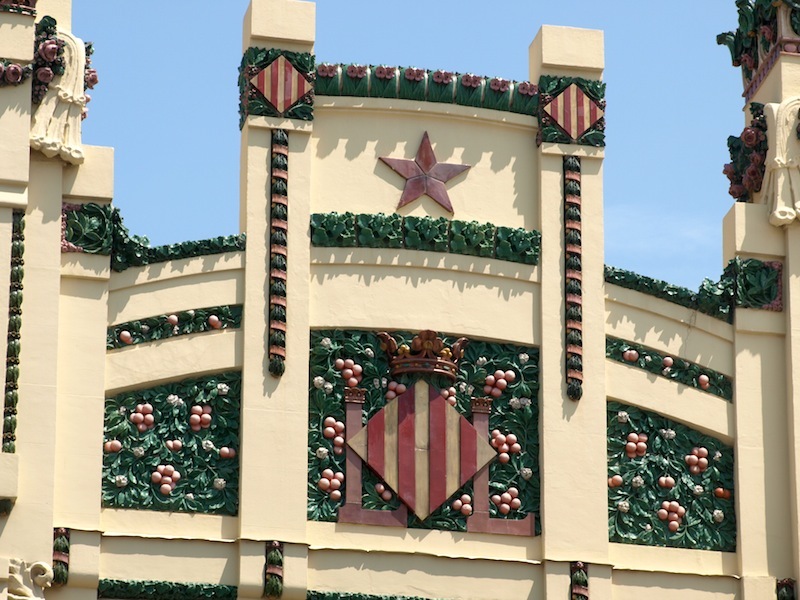 Note the striped pallet, the Valencia oranges once again and the five pointed star set in the false arch. King James wrote following the conquest of Valencia: ‘We were in the riverbed, between the gardens and the tower: and when we saw our flag upon the tower, we dismounted from our horse, and heading eastward we cried from our eyes and kissed the earth for the great mercy God had made to us”. Quotation from Wikipedia. 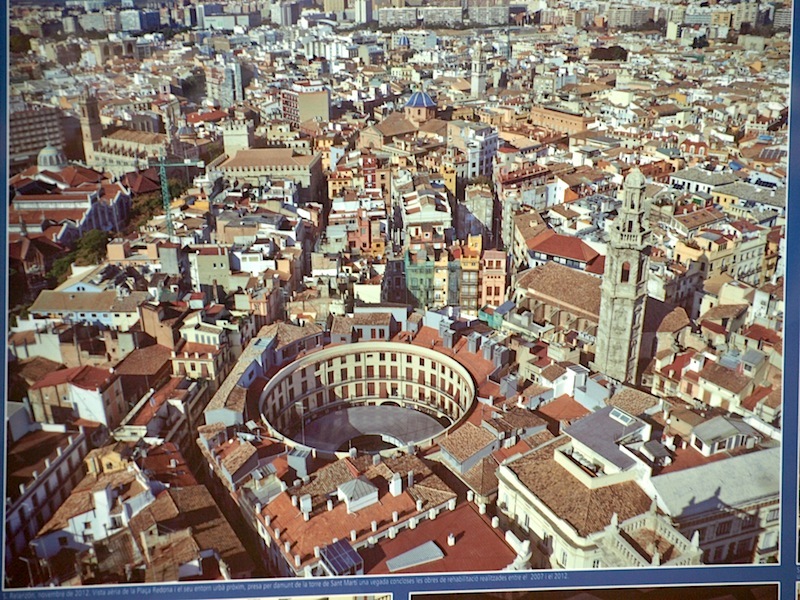 The conquest of the Kingdom of Valencia (removal of the Moors) commenced in 1232 and came to an end in 1238. The pennon of King James. 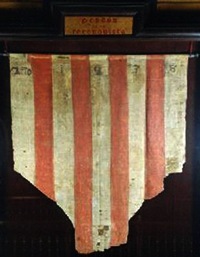 The Pennon was made from a piece of white cloth upon which four red stripes were painted. It now hangs in the Valencia City Hall. A sketch showing a few of the many pennons. 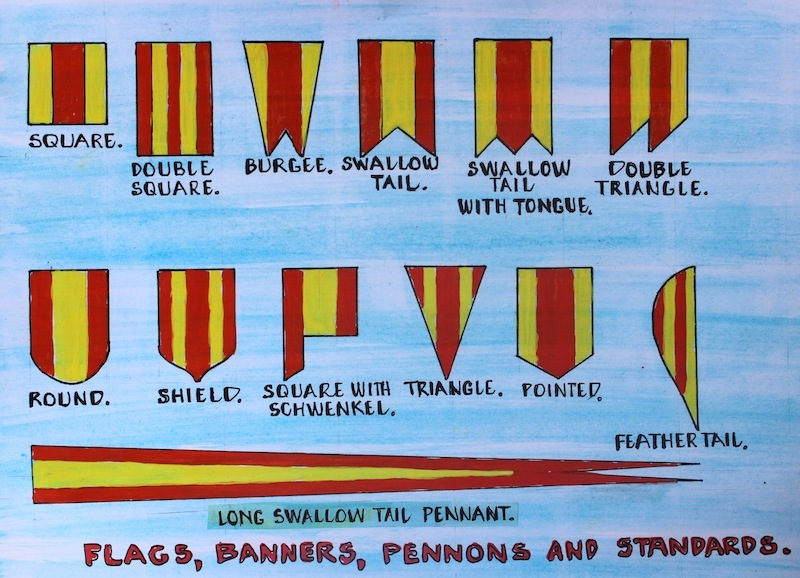 A pennon was a personal ensign and essentially the flag of the Knight Batchelor. Bev exiting the railway station. The plaza and the Union and Phoenix Insurance building directly in front of the railway station. 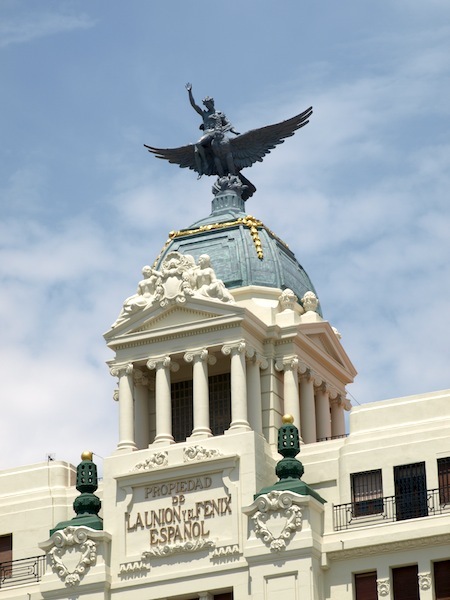 A bare-chested youth riding the Phoenix on top of the Union and Phoenix Insurance building. In Egyptian mythology the Phoenix was a bird that lived in the desert for five hundred years and then consumed itself by fire, later to rise renewed from its ashes. 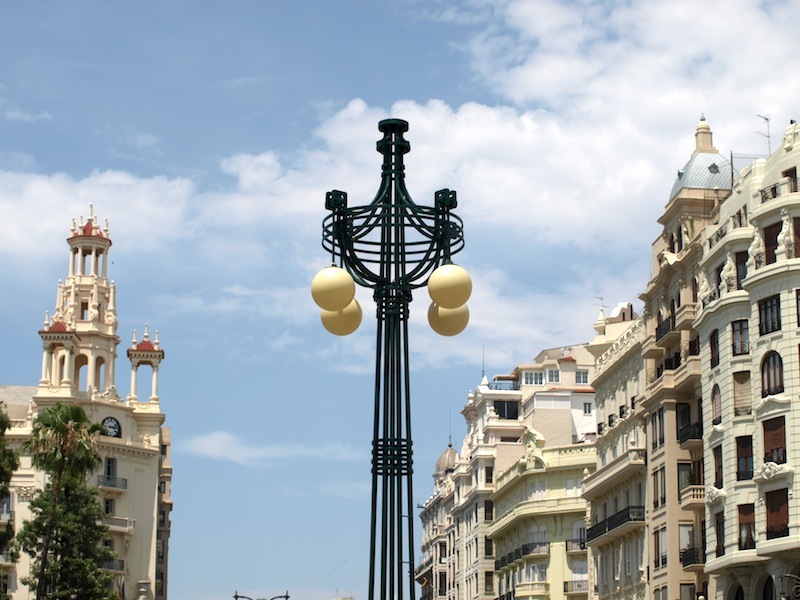 Valencia is without doubt one of the most beautiful cities in the world and to see all of what the city has to offer one would need at least a week, if not more. 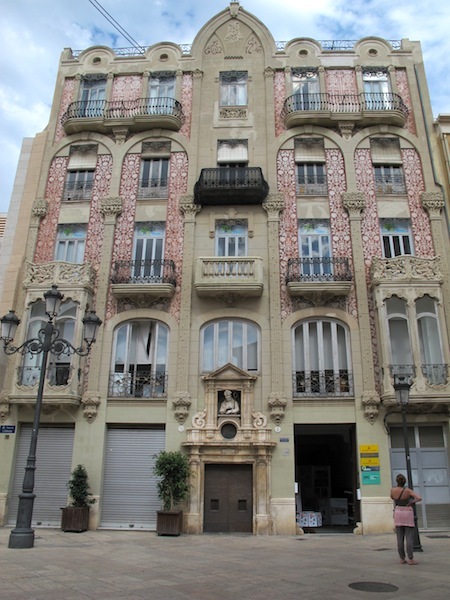 The buildings we were particularly attracted to were those of the Art Nouveau period. Following are a few images of the period. 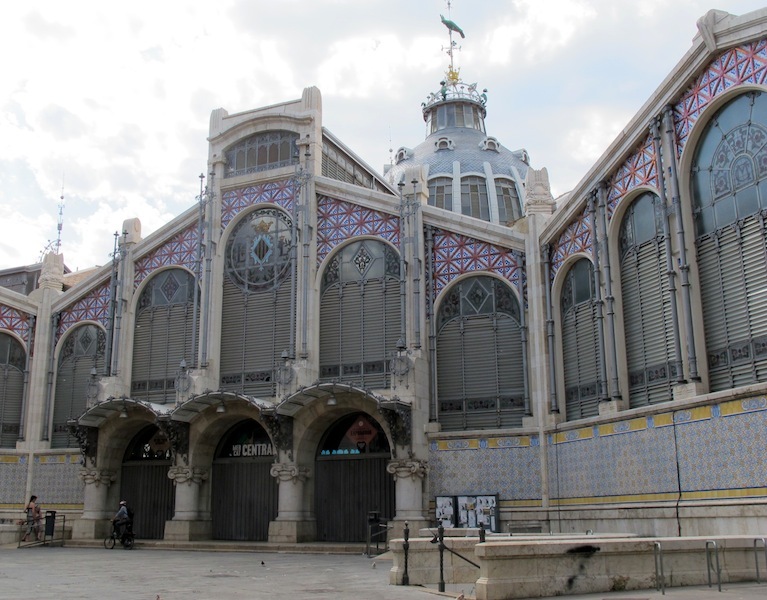 Valencia’s magnificently restored Colon Market building. The facade of the Colon Market. 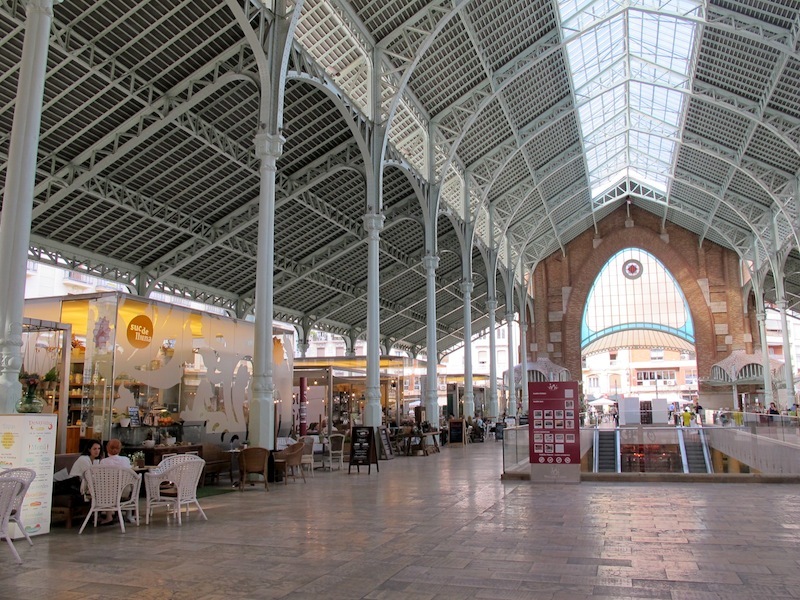 Cafes inside the markets. The construction is a credit to the forgers of steel. 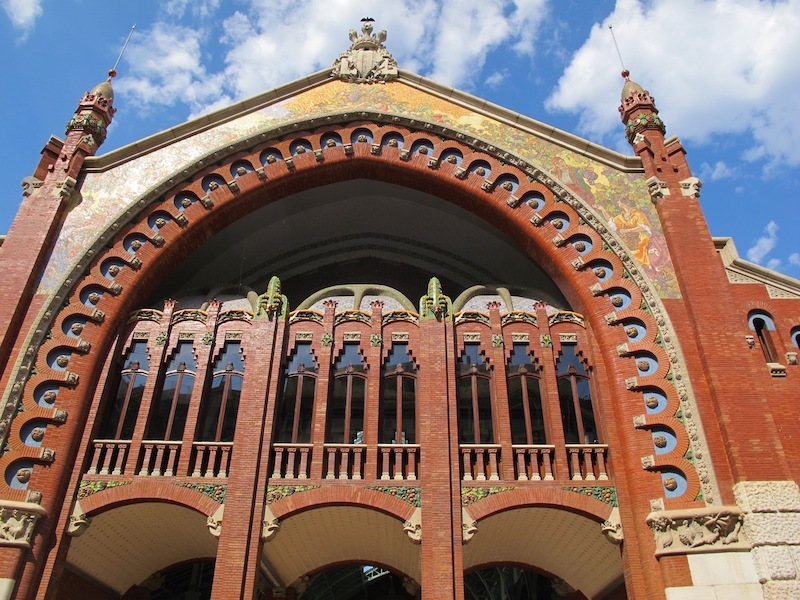 Another wonderful period building, the Central Market. 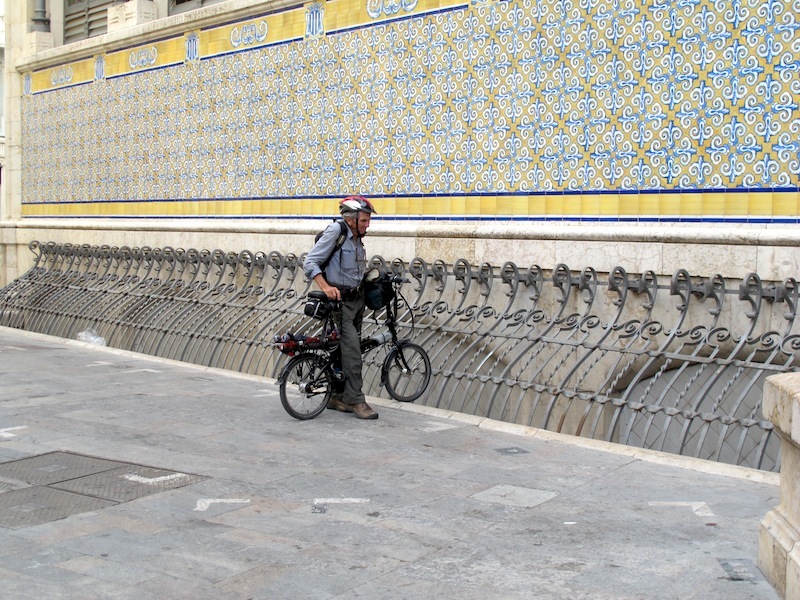 Note the intricate louvers and tile work. 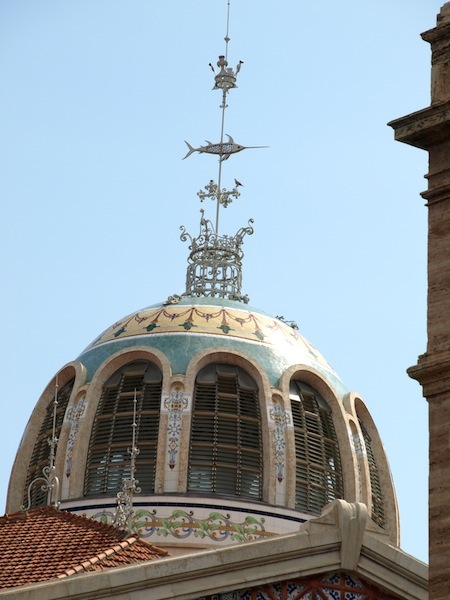 The tiled cupola and finale of the Central Market. There are two pointers indicating the market was essentially a fish market: the marlin on the finale and the louvers. Louvers are a common feature on market buildings all over Europe as dead fish are often ‘on the nose’ (smelly). The reason fish smell is that dead fish exposed to the air oxidise faster than land-based animals, producing a characteristically unpleasant ammonia odour. Consuming ammonia can make one ill and therefore the word ‘fishy’ indicating something that should be avoided is derived from the ‘fishy’ odour. 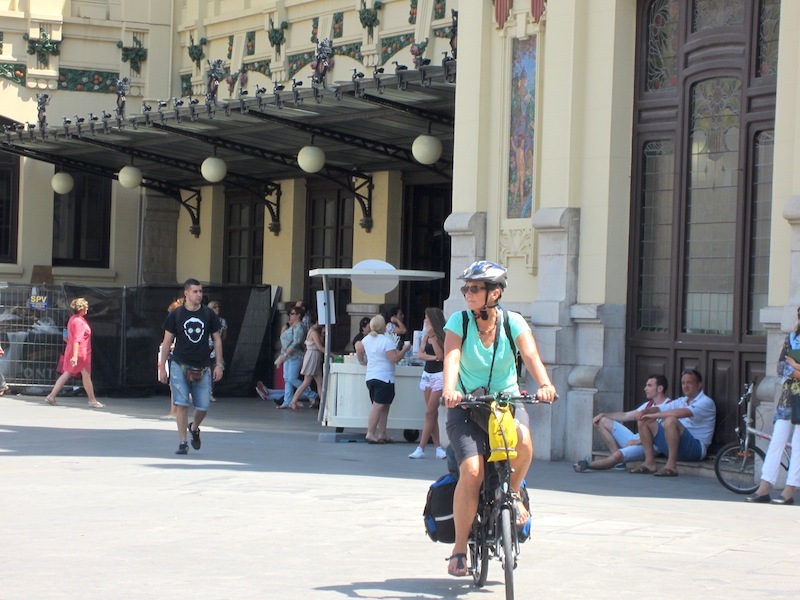 Deciding what modification needs to be done to turn the ornate grill at the front of the markets into a bike rack. Riding under a ladder is one of the hazards of riding on the footpath. 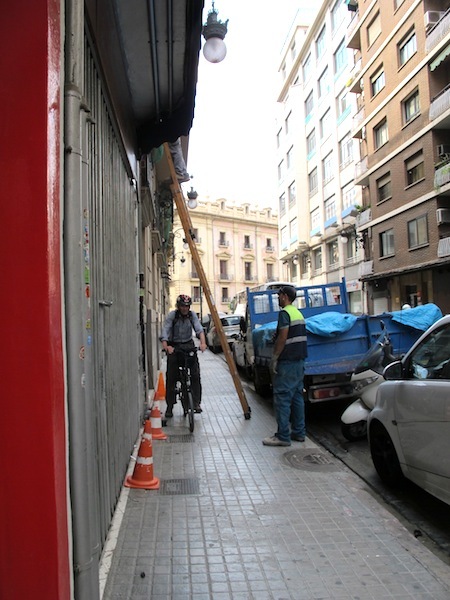 There has been a long held belief that passing under a ladder will bring you bad luck and there are a number of explanations why. In medieval times a ladder symbolised the gallows, something one needed to keep well away from. Another reason was when a ladder was leant against a wall the triangle that was formed by the ladder, wall and ground signified the Holy Trinity, the Father (God), Son (Jesus) and the Holy Ghost (the Spirit of Jesus). Therefore the action of passing through the triangle was considered blasphemous and a desecration of God. If one has to pass under a ladder there are a number of ways to break the bad luck spell which include walking backwards under the ladder, crossing your fingers and not uncrossing them until you see a dog, or wetting your finger and placing a crucifix on your shoe and not looking back until it dries. 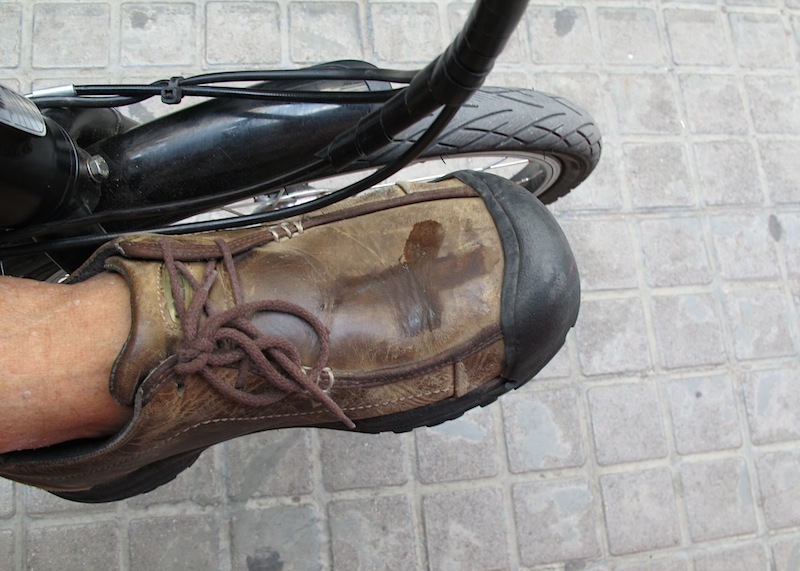 Try crossing your fingers and then closing your hand as if gripping the handlebars of a bike, it is impossible to keep them crossed, I therefore chose to inscribe a cross on my shoe. The wet crucifix. I tried explaining my action to the workman but I think he thought me mentally challenged. In days gone by we used the terms ‘screw loose’ or ‘not the full quid’ but these days the use of such terms is considered to be politically incorrect (and rightly so) and we use the term ’mentally challenged’. 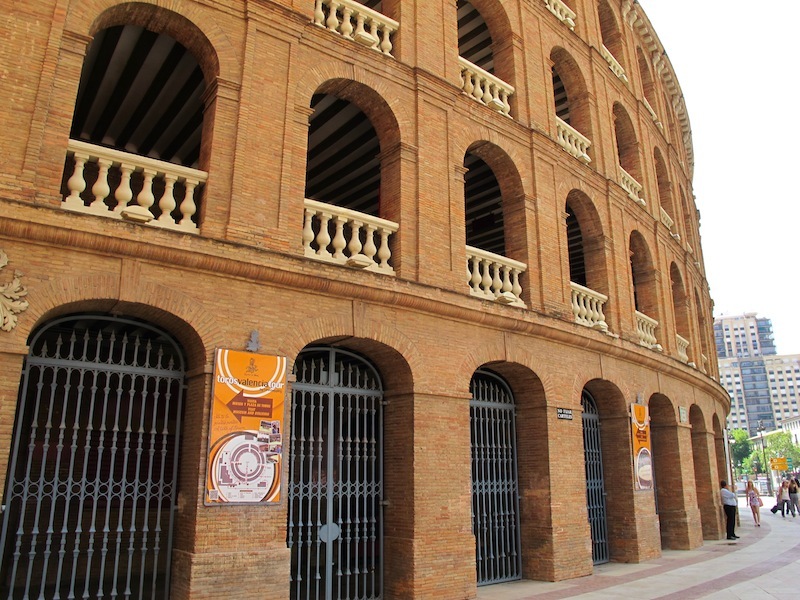 When Bev and I were out riding in Valencia we came across the famous Plaza de Toros bullfighting arena and because to date I have not written about bullfighting in Spain I will do so now. 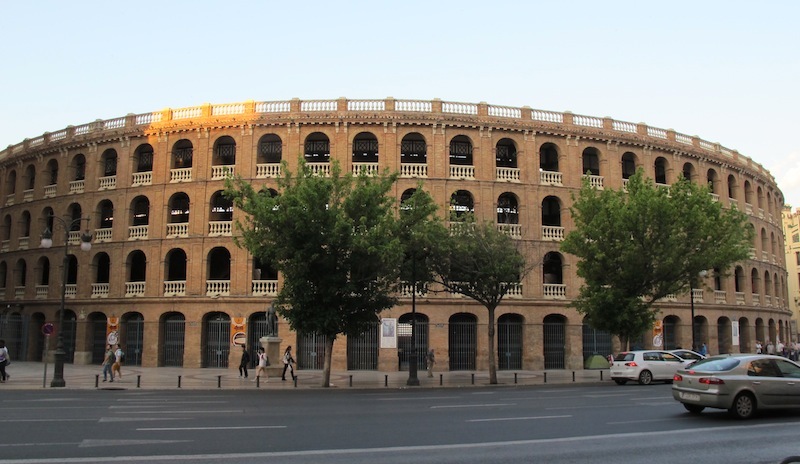 The bullfighting arena, Plaza de Toros de Valencia, was built in 1841 and holds 10,500 spectators. Close up of the fine brickwork on the bullfighting arena. To make a perfect circular building takes some skill. The spectacle of bullfighting has existed in various forms since Egyptian times, however it was the Moors from North Africa who developed the sport from a brutish formless spectacle to a spectator entertainment involving horses where the rider killed the bulls. Clowns on foot aided the horsemen by positioning the bulls using capes. As time passed the clown antics began to draw more attention than the horsemen and the modern bullfight began to take form. 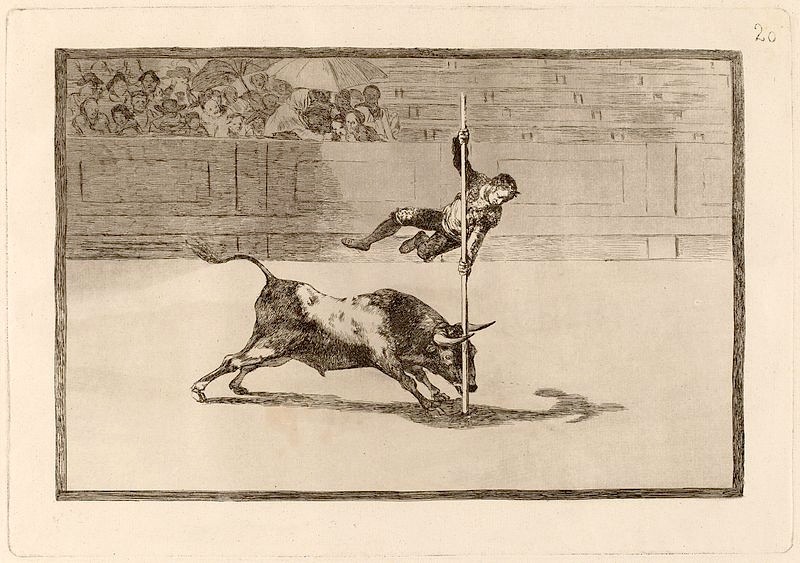 Today bullfighting in Spain is much the same as it was in the mid 18th century when a matador using a cape and a lightweight sword killed the bull. 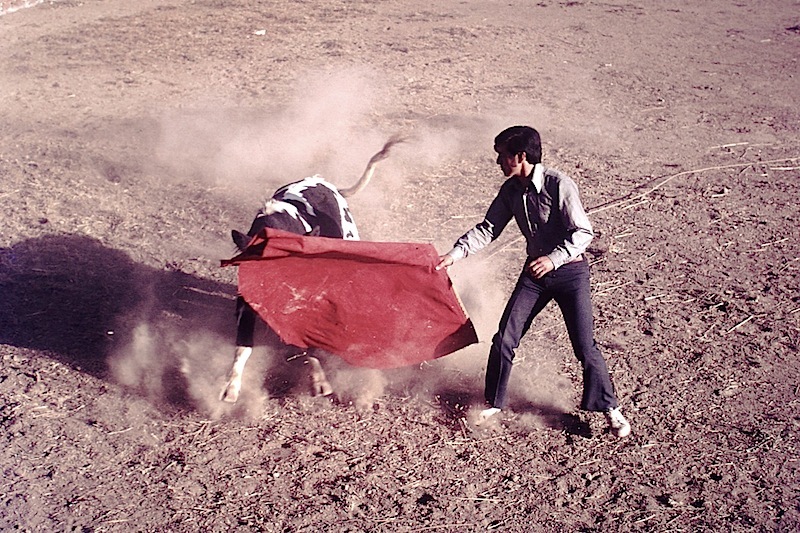 A 1972 photograph of a matador in training. Because bulls are colour blind it is a myth that bulls are attracted to red. They attempt to horn the cape because it is a larger form than a human body and they go for the larger image, the cape is red because red represents power and strength. 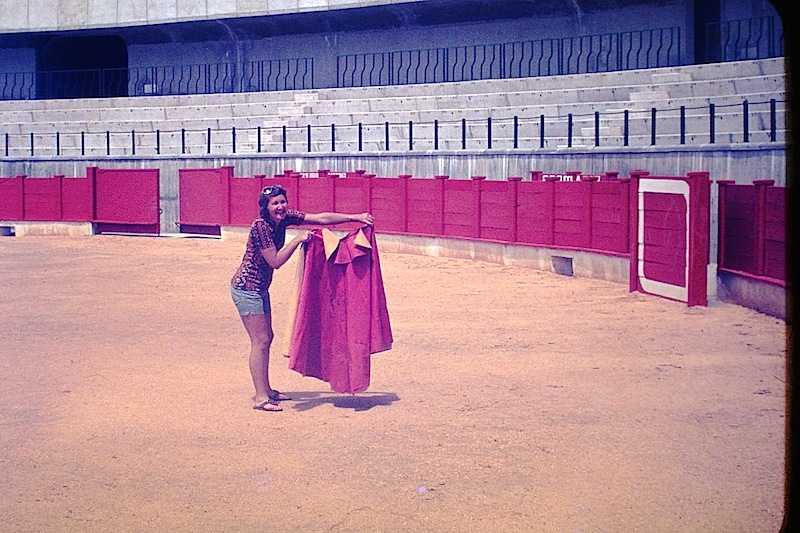 Bev waving a cape in the Malaga bullring 1972. The law in Spain relating to female bullfighters is simple: it is against the law and the law is based on grounds of public morality. It would not do to expose the woman’s body in front of spectators should she be gored. One particular critic of women bullfighters said: ‘Women should be in the kitchen, backing up men. It is unnatural for them to fight’. An etching of an acrobat with agility and audacity by Francisco Goya 1816. Image credit: image is copyright free. Bullfighting in Spain, even though it is a national tradition, it is on the wane. Some say the sport is in crisis and already in some regions the killing of the bull is considered to be inhumane. Bev and I have never been to a bullfight, in fact we have never been to any exhibition involving the tormenting of animals for entertainment, such as a rodeo. We consider those activities to be cruel for the animals. Often when we get near the end of a post we have photographs that we want to include but nowhere in the narrative to put them. The following photographs are a few such images. Banca de Valencia making use of a wedge allotment. 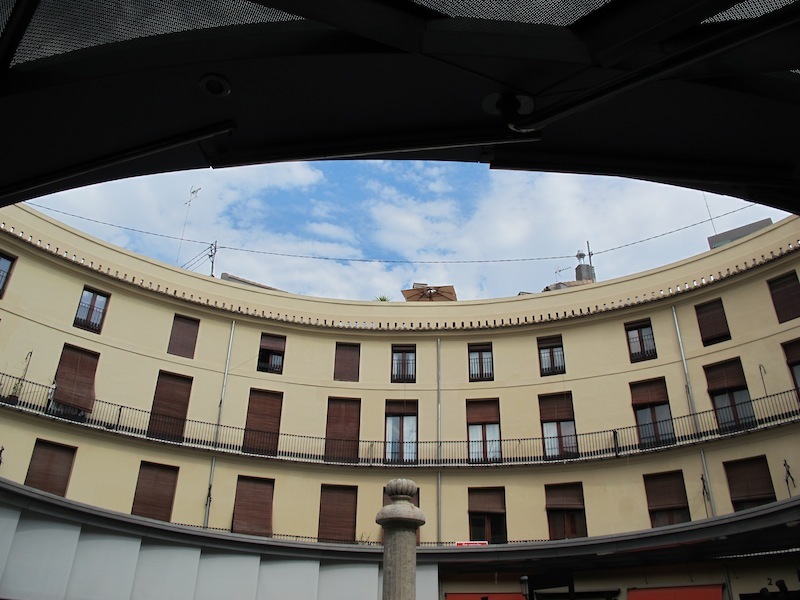 One of the most visited places in Valencia is the three level Plaza Redonda, commonly known as the hole because of its circular shape. Its origins date back to 1840. The lower floor of the complex houses many shops devoted to soft craft souvenirs and materials of interest to the dressmaker such as lace, bindings, materials and such things. 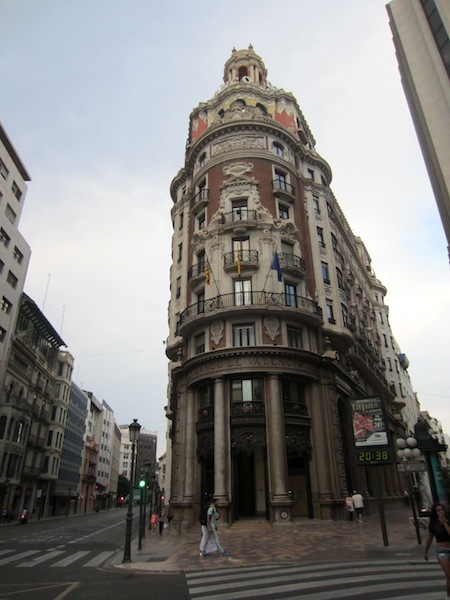 Upper floors of the Plaza Redonda. Creative false arch facade of a building somewhere in Valencia. 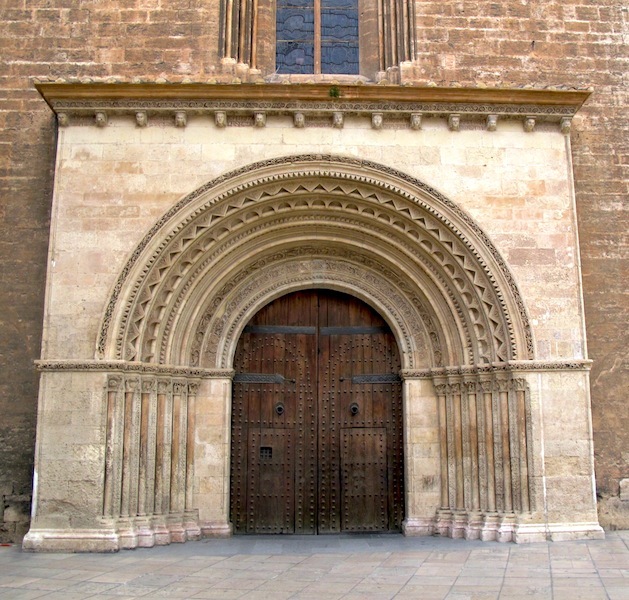 An unusually plain portal or entrance to a church in Valencia. 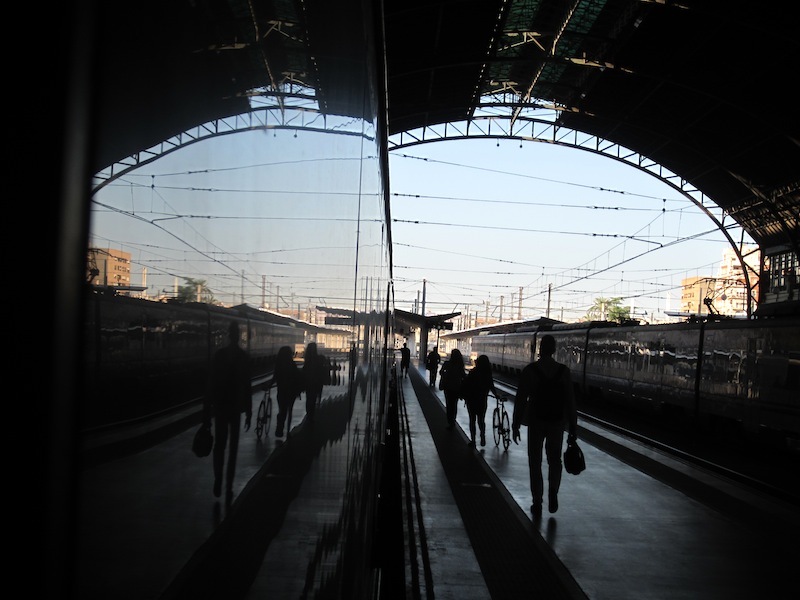 A reflection in the side of the train at Valencia Railway Station the morning we left for Barcelona. The next post, as the caption above suggests will relate to Barcelona. We hope you tag along.